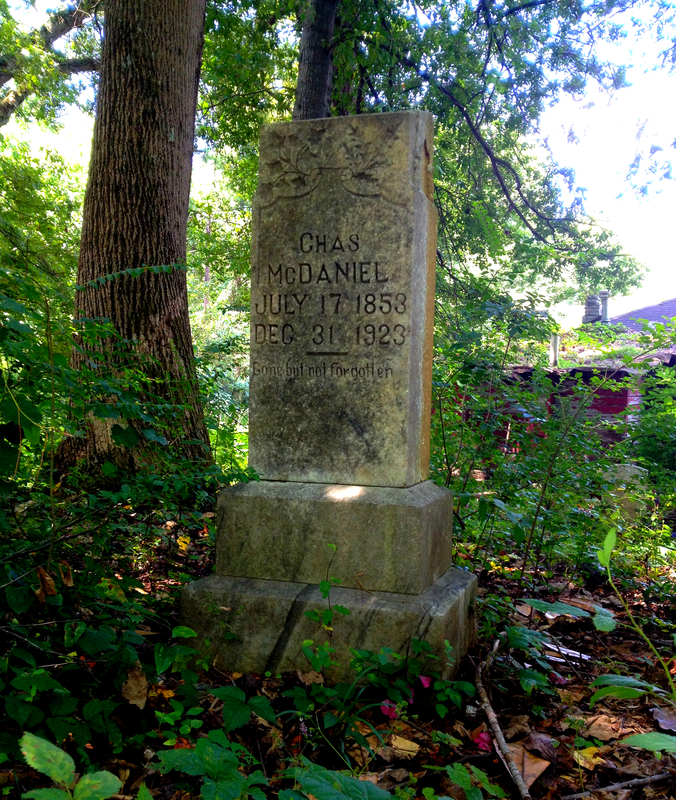 In celebration of Halloween we have traveled out to several Atlanta cemeteries to not only record their current state, but to explore the history behind these graveyards. For Part 1 of this series we explored Thomasville Cemetery, Alsobrook Family Cemetery and Sylvester Cemetery. Atlanta Cemeteries Part 2 looks at the Todd Family Cemetery, Harmony Grove Cemetery and Historic Sardis Cemetery. 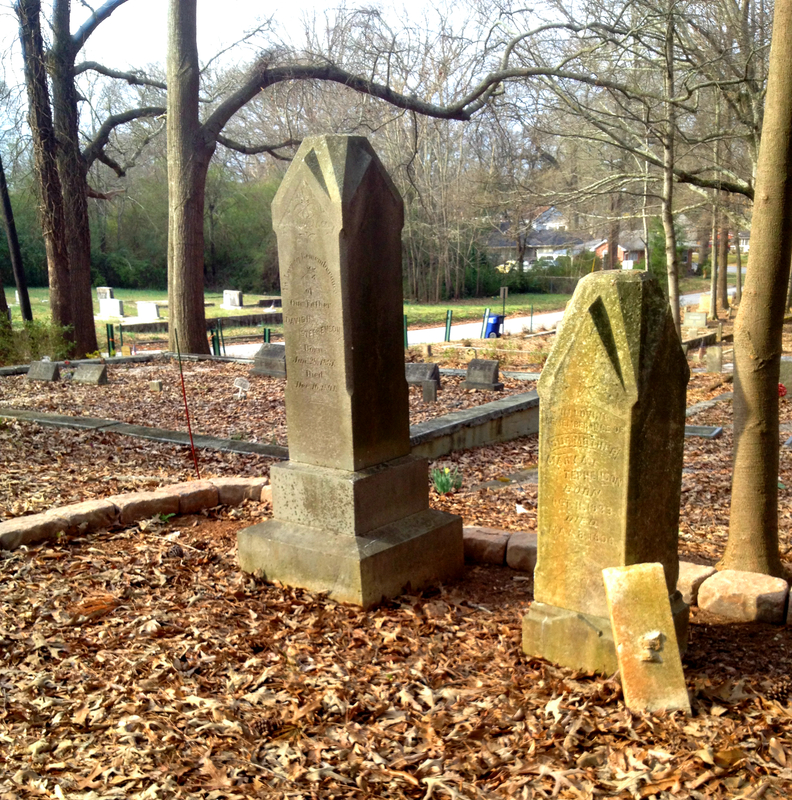 Todd Family Cemetery is a burial ground in the backyard of Virginia-Highland residence. 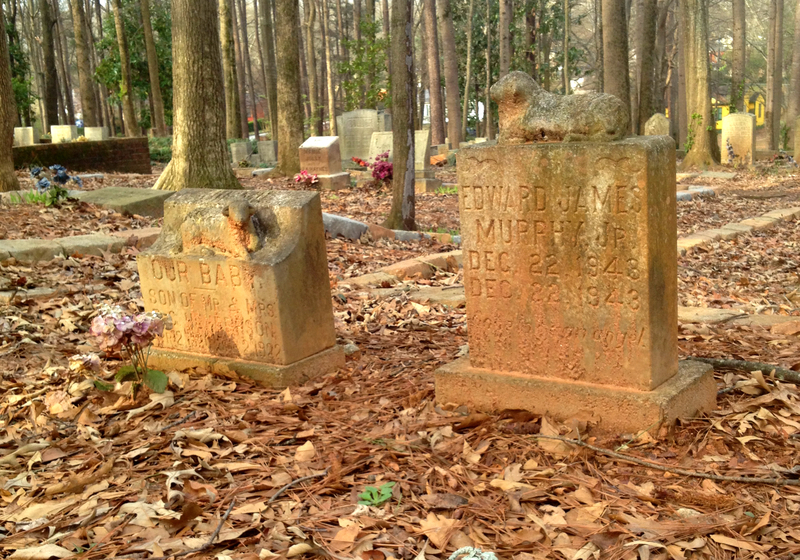 Harmony Grove Cemetery is a restored graveyard in Buckhead with a diverse history. Sardis Church Cemetery has been maintained wonderfully by its sister church. Atlanta Cemeteries Part 3 explores Scottdale Cemetery, Washington Memorial Gardens and Peachtree Baptist Church. Scottdale is an old mill town cemetery. Washington is an African American cemetery with old slave burials. 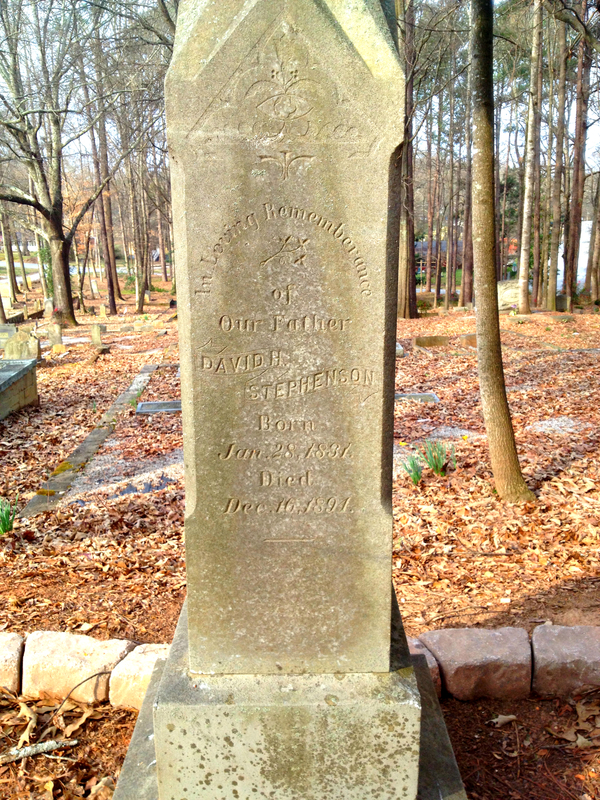 Peachtree Baptist Church is a typical Victorian cemetery, with intricate headstones and an old-world atmosphere. 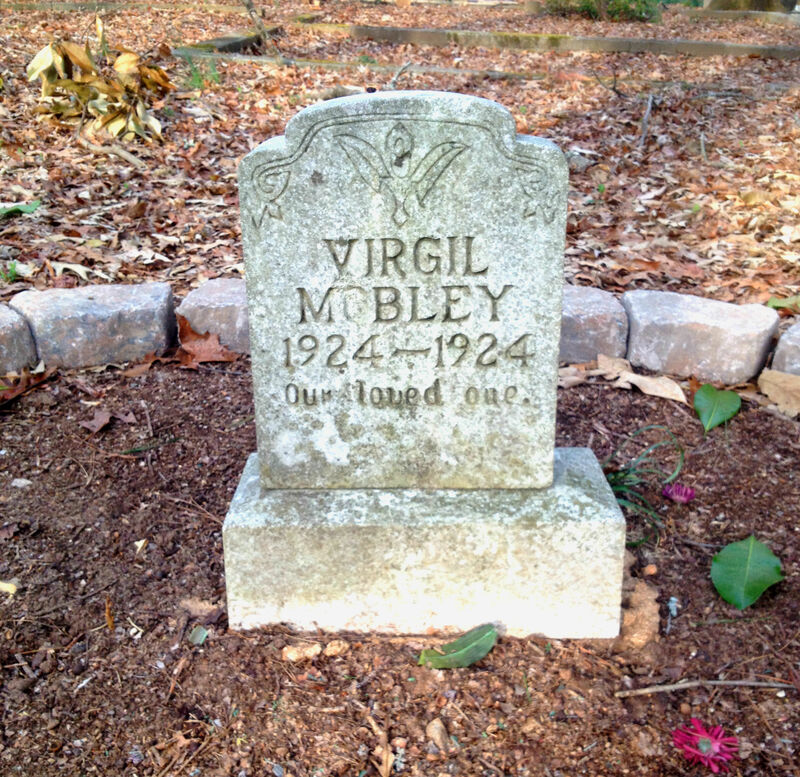 History of the Cemetery & Other Notes: A walk through Thomasville Cemetery is a walk through yucca plants, magnolias, briar patches and ivy. 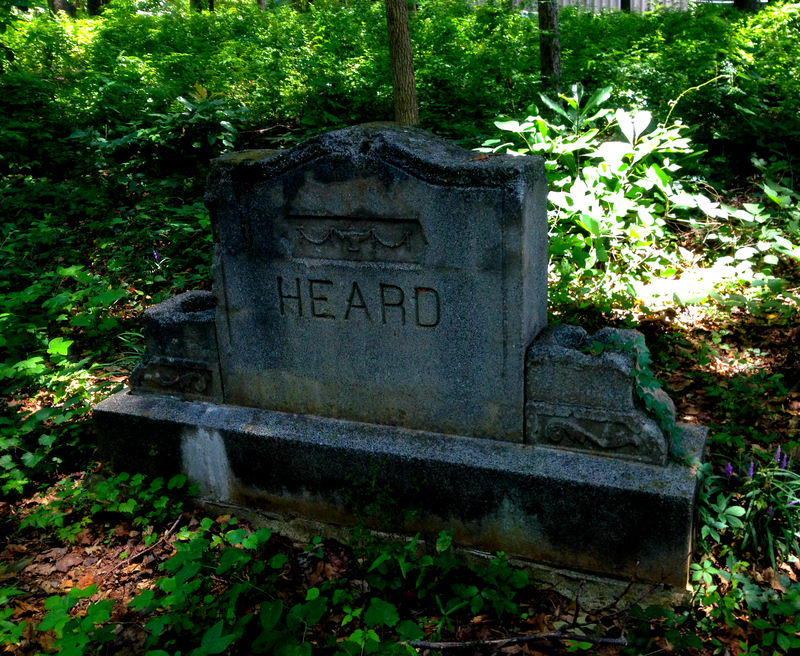 This abandoned cemetery on the southeast side of Atlanta is overgrown with nature. Headstones are few and, buried under organic growth, hard to locate. Many of the dead were probably marked using simple field stones, yucca plants and magnolias. The first burial was in 1878 and the last known burial was in 1952. Records are thin on Thomasville Cemetery; a family named Almand may have originally owned the land. 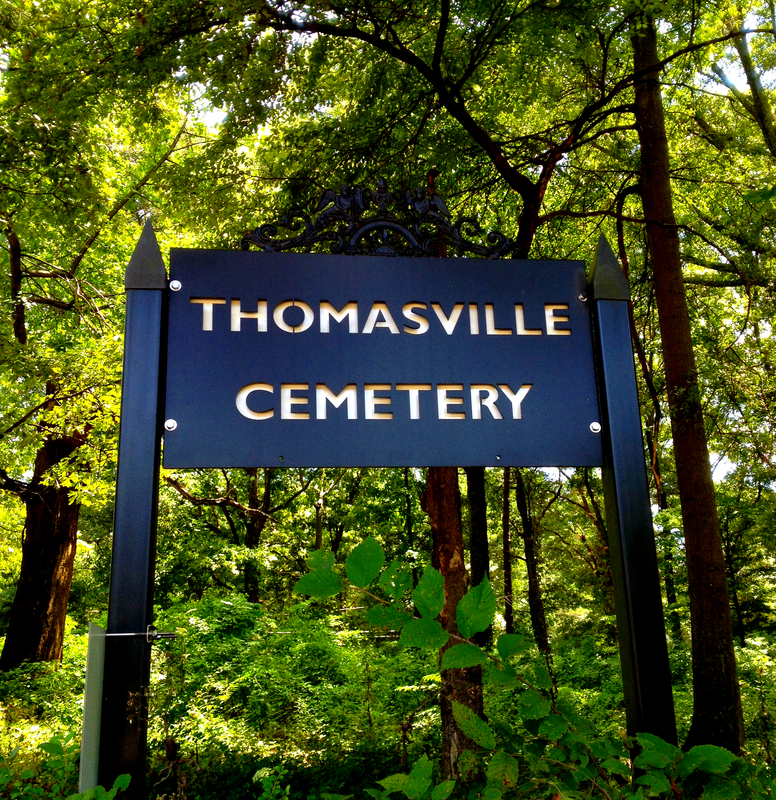 There are both African American and white burials at Thomasville; at some point in the last portion of the cemetery’s history local whites refused to let African Americans be buried in the graveyard. It was named Chestnut Knob until the 1930’s, and according to neighborhood lore, the cemetery was renamed Thomasville after the Rev. Henry Thomas, one of the founders of the Mt. Carmel AME Church on McDonough Boulevard. Atlanta Constitution obituaries since the 1930’s list Thomasville Cemetery as the interment place for many African American dead. Ownership and How You Can Help (Maybe): It seems no church or charity organization is truly in charge of Thomasville Cemetery. Mt. Carmel AME Church holds the deed but has not been involved with cemetery clean up efforts. While cleanup crews organized by local residents have been out to the cemetery in the recent past, it quickly grows back in just a few months. Over the past summer Thomasville Cemetery was again overtaken by bushes, vines and small trees. Maintenance is key to cemeteries, and this particular cemetery suffers from the lack of regular care. Local residents associated with the cleanups started the Thomasville Cemetery Restoration Project Facebook page to spread the word about projects at the site. The next cleanup is November 8th, 2014. Location: 2253-2289 Jones Road NW Atlanta, GA 30318 snuggled between two residences (2295 Jones Road NW and 2253 Jones Road NW Atlanta, GA 30318) on the east side of Jones Road. History of the Cemetery & Other Notes: There’s not much information out there on the Alsobrook family and their cemetery. It’s located out on the west side of Atlanta, near the perimeter. But it’s a wonderfully small family plot worth the visit. 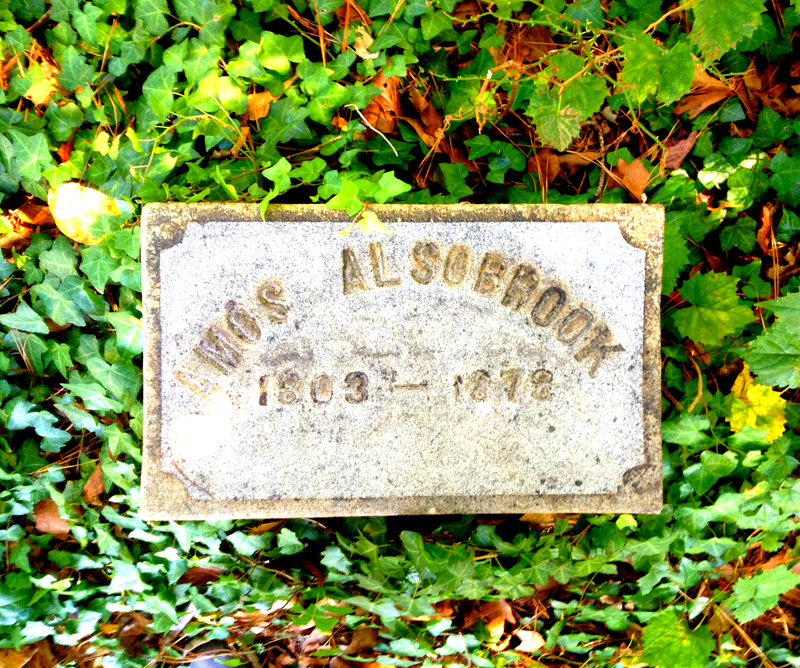 Online sources indicate the first burial was Jesse Alsobrook in 1840 or 1841; the last burial was John Columbus Alsobrook, buried in June of 1908. 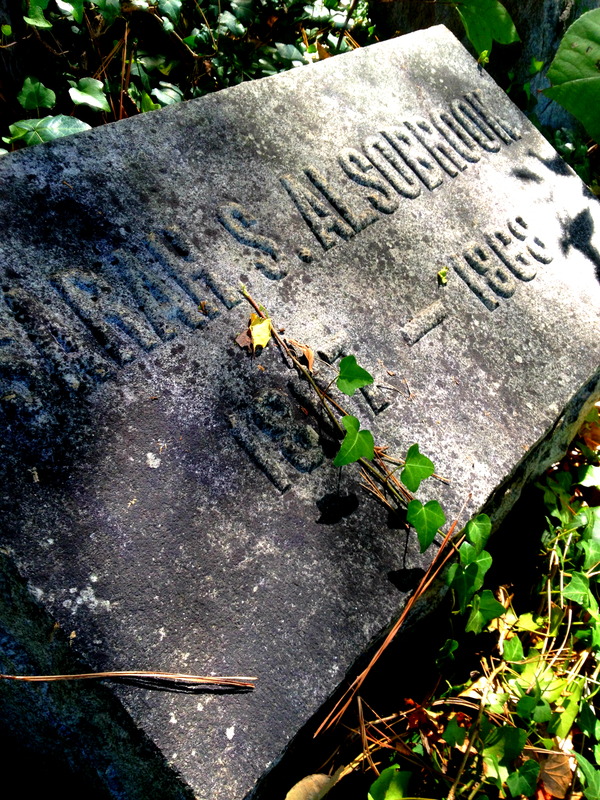 The cemetery lies on land that was once owned by Wilson C. Alsobrook (Jesse Alsobrook was his son). Wilson Alsobrook owned Land Lot 240 of the 14th District of Fulton County starting in the middle 1800’s, and his ancestors occupied most of his lands until the 1940’s. This is according to online sources that haven’t been fully verified; if you have more information about the Alsobrook Family Cemetery please share them in the comments section below. Franklin Garret paid a visit to the graveyard in February 1931 – his Necrology lists 17 graves, but some sources list only 11. Most of the graves are for Alsobrook family members, but some do carry different last names, such as Brown. 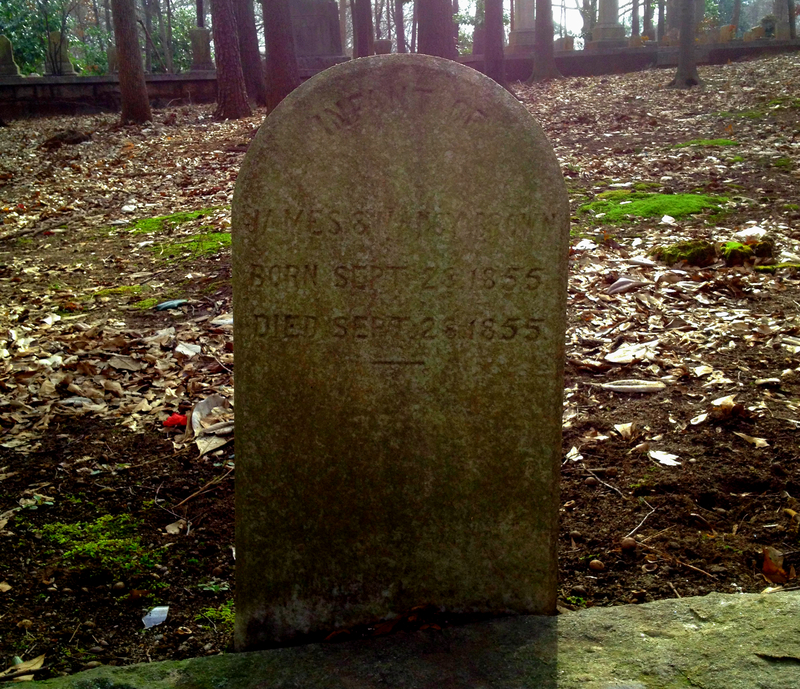 But most likely all of the graves are related to Wilson Alsobrook. 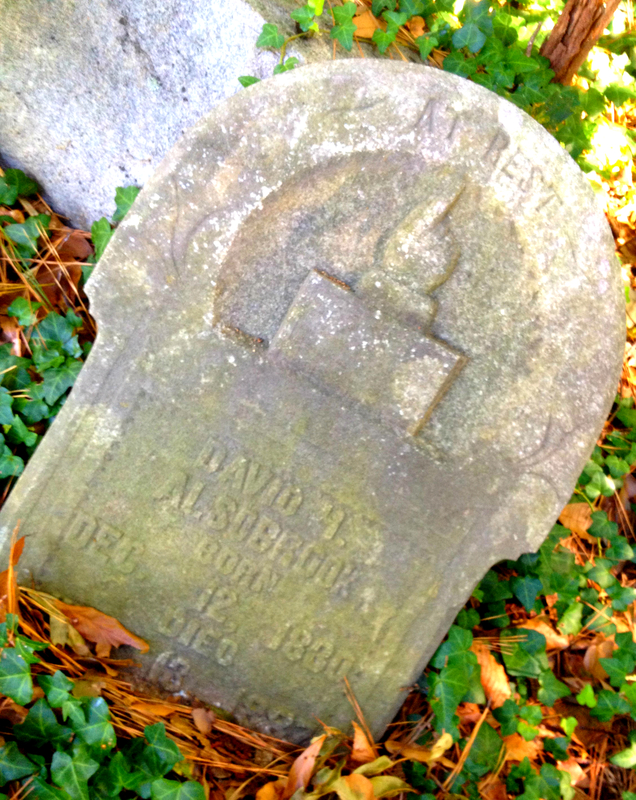 The gravestone of David Alsobrook, buried in 1887, is memorable. While broken in half, the design carries Victorian charm and an old-world look that is exceptional. Ownership and How You Can Help (Maybe): I’m not quite sure. 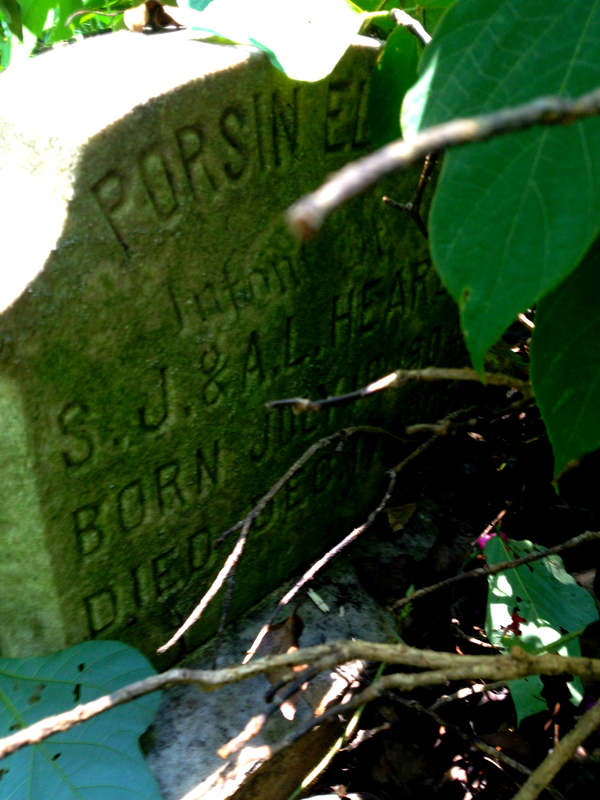 Fulton County tax records list BX Corporation Cemetery as the owner. As of time of publication, History Atlanta could not locate more information on this group. Tucked away like it is in a residential neighborhood between two homes, I would imagine many of the local residents help care for this cemetery. Yet when I paid a visit it was overrun by trees and shrubs. Unfortunately the care of the cemetery could have been tied to a local church that has gone away. Ella Lou Knight Alsobrook, the wife of John Columbus Alsobrook (the last recorded burial in Alsobrook Family Cemetery), was buried at the nearby Mayson Methodist Church Cemetery in 1933. It seems the Alsobrook Family Cemetery and the Mayson Family Cemetery were both tied to Mayson Methodist Church, which is now defunct. 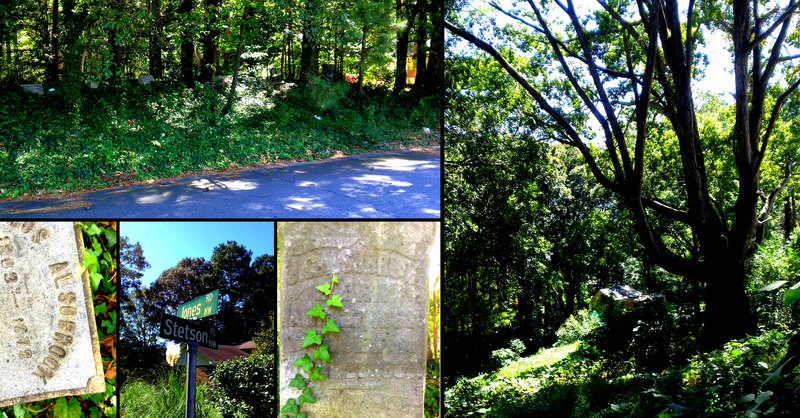 History of the Cemetery & Other Notes: It starts with the history of East Atlanta Village. That history starts with the forced and unforced removal of the Creeks and Cherokees in North Georgia. From the early 1800’s and throughout the 1830’s Native American lands from these tribes were gradually passed to the state of Georgia. The means used by Georgia to obtain the land falls upon a broad spectrum, from violent forced removal by the Federal government to greedy half-white half-Native American chiefs selling tribal land to benefit their growing estates. One such tribal chief was William McIntosh of the Creeks. McIntosh sold thousands of acres east of the Chattahoochee, land that would become East Atlanta Village, to his white cousin the governor of Georgia through treaties in 1821 and 1825. For selling land without approval of the tribe McIntosh was murdered by hundreds of Creek warriors that invaded his plantation home one night in April of 1825. For a detailed history of East Atlanta Village, the Scarface-like demise of William McIntosh and Sylvester Cemetery read Help Sylvester Cemetery. In addition to McIntosh selling land, the Indian Removal Act of 1830 certified Native American relocation by the Feds, by peace or by force. Some sources indicate the Creeks were still around East Atlanta as late as 1838. The area that now holds Sylvester Cemetery and much of East Atlanta Village (202.5 acres) was granted by the state of Georgia to either Thomas Simmons or Lofton Johnson in 1834 or 1835. If it was Lofton Johnson he immediately sold the land to Thomas Simmons who built a gristmill and a sawmill on Sugar Creek. Sugar Creek still exists, running for a short portion next to and under I-20. Simmons damned the creek and created a huge lake that would become known as Terry Mill Pond. By 1837 the Simmons sawmill was one of the largest in the area, supporting many of the surrounding boom towns, including one small settlement three miles away sometimes called Terminus, sometimes called Marthasville. Thomas Simmons’ wife became ill and passed away, probably in 1838. In 1839 he married her caretaker, a woman named Elenor Terry. When Elenor Terry moved to the Simmons farm she brought her two younger children, Thomas and Elizabeth. Elenor also had an older daughter named Nancy who followed her mother to the area with her husband James “Spanish Jim” Brown from Lawrenceville, Georgia sometime before 1838. The Browns are considered the first white settlers of East Atlanta, residing on a homestead near the intersection of Moreland Avenue and Flat Shoals. 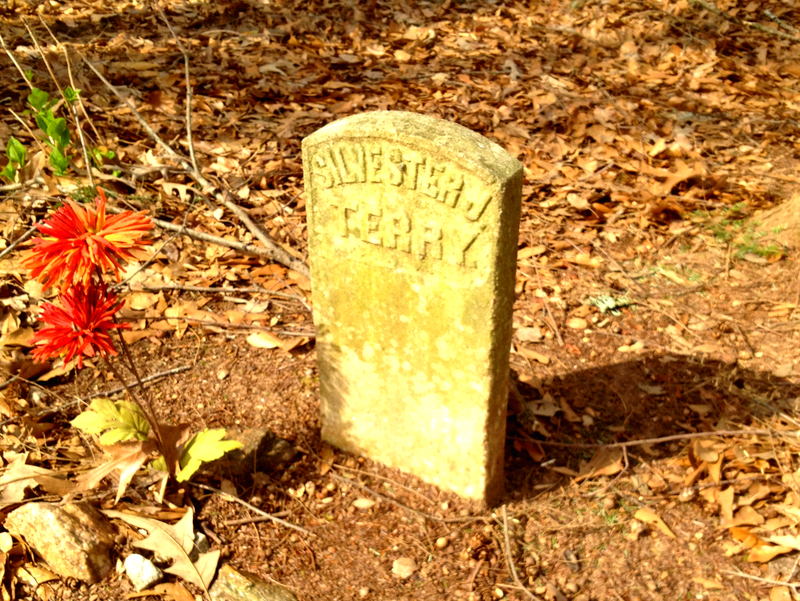 The first burial in Sylvester Cemetery was an infant child of Nancy and Jim that died in 1838. Simmons died in 1841 and left his gristmill and lake to his wife Elenor Terry. He is buried in Sylvester Cemetery. The stepson Thomas Terry took over operations and ran a successful business throughout the 1840’s and 1850’s. As the families grew so did their graves and it remained a Brown and Terry family cemetery into the 1870’s, when it became a commercial burial ground. Why the name Sylvester Cemetery? In the early 1870’s Mary Jane Thurman Terry leased land next to the bone yard to a church under the condition they name it Sylvester after a recently deceased son (he’s buried in the cemetery). Over time the church name transferred to Sylvester Cemetery. It has famous names from East Atlanta history such as Fiddlin’ John Carson, Sheriff Jake Hall and William Zuber, who built Zuber Mansion on Flat Shoals Road. Today Sylvester Cemetery holds the final resting place for nearly 1,400 people, 250 of which are in unmarked graves (mostly children). There are 15 Civil War veterans among sixty-seven veterans total. But each year the number of people who remember the dead in Sylvester Cemetery decreased. While burials still occur on family plots, by the 1970’s the cemetery was practically abandoned except for the occasional burial or family member visit. It was a nasty green space, overtaken by shrubs, vines, empty beer cans, burned out stolen cars and piles of trash. Ownership and How You Can Help (Maybe): That blight changed in 2000, when the Sylvester Cemetery Foundation was created. This nonprofit organization is dedicated to the cleanup of the grounds, research of the deceased and restoration of the headstones. The Sylvester Cemetery Foundation has cleared out debris such as abandoned vehicles, created an offsite archive and cleaned markers that were covered in growth. But the Foundation does need help. Do you live in East Atlanta Village? 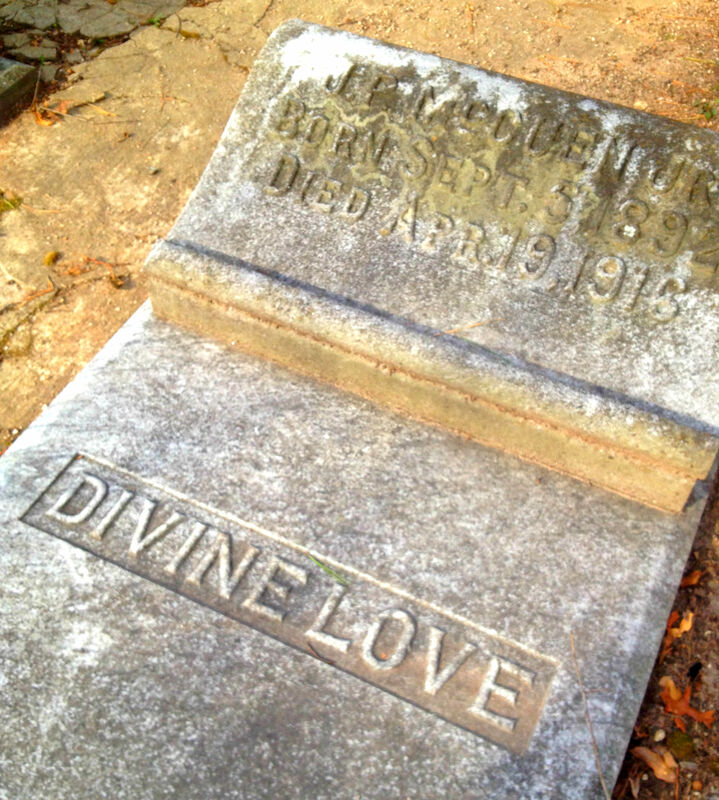 Volunteer a Saturday and help this piece of EAV history; start by visiting the Sylvester Cemetery Foundation website. Interested in discovering more about the history? Read the History Atlanta article Help Sylvester Cemetery to learn more about the history of the cemetery and the land that would become East Atlanta Village. I wonder if that is the same Charles McDaniel who has a park named after him up in my neck of the woods (North DeKalb). I’ve been trying to find the origins of the name of that park. There are many Charles McDaniels coming up in the AJC database. Have you tried DeKalb parks? They could know the name as well. Thanks, this will be exponential multu-parter. Yes Terry it will have multiple parts. Thanks for the comment. Any suggestions? Thanks for another superb piece, Conor.